In this update, I wrote a narrative for our Answer to the 2nd Amended Complaint. Ms Baranow bought her first lots in the New Tucson / Sycamore Vista subdivision sight-unseen on April 9, 1997. She was surprised that there were no streets when she went out to see the lots but liked the area and bought fifty more lots in the subdivision. 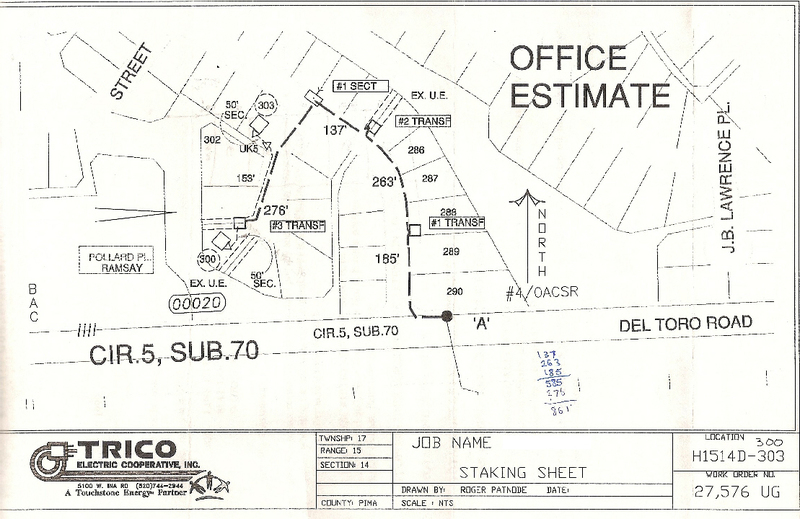 In late 1999 she had four lots in Unit 5 surveyed, these lots are subject of this lawsuit. Trico electric drew up plans for bringing electricity to the lots. 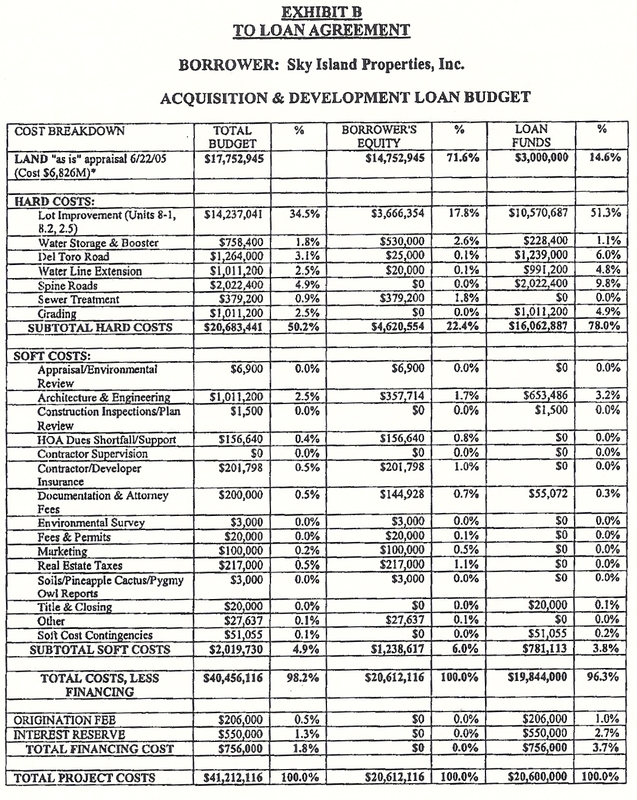 Ms Baranow also had building plans on a half-acre lot in Unit 7 (filed with County Development Services, November 13, 2000) and was thinking of buying a water tanker truck to deliver water and buying/renting a backhoe to dig trenches for the electric and septic tanks. I had plans to bring electricity to eight of my lots in this southwest section of Unit 5 put in septic tanks and sell lots to hippies. I also had cabin plans for a lot in Unit 7. Shortly thereafter someone called Ms Baranow and offered to buy her lots, she noticed that someone was buying up all the delinquent tax liens on the majority of other lots in the subdivision. Sometime in 2002 she noticed someone was flipping lots among shell companies, which caused the assessed value to skyrocket from $500 to $12,000 within a few years. (A good example of this flipping is on parcel 305-33-1050 in Unit 8.) When Ms Baranow brought this up at one of the first HOA meetings and offered to sell one of the flippers her lots for $15k each, that person (Mr. Figueroa) got very mad and had to be restrained. As time went by, Ms Baranow became suspicious that the majority lot owners were assessing our lots for too much money as if it were a money-making opportunity for them. Some of the lots were assessed $6000 or more and no dirt was turned on those lots, it was taking the developers a long time to put in infrastructure. In end of 2007, Bob Bambauer, a Vice president for KB Homes, one of the builders in the subdivision came to one of our HOA meetings, after the meeting he met with about 20 of us and told us we were being overcharged and that a major homebuilder sued the majority lot owners for a substantial amount of money because they did not honor a contract to sell lots at an agreed price. The case was settled out of court and Mr. Bambauer and his mother were threatened for disclosing information from the lawsuit. We [Mr. Soriano] spoke with Jeff Utsch as the President of the Homeowners Association prior to purchasing the lot in 2006. We then found out he was not only the president of the Association but also the owner of the majority of lots. The reason we were talking to him was due to the Homeowners Association also being the developer of the roads. We were told by Mr Utsch that the Association was going to build all of the roads as well as the water and sewer lines and then the HOA would assess us for the cost of the improvements. At the time he said the assessment was $27,000 per lot and that he could not guarantee the final costs. As we sit here today in March 2008, they still have not told us the final costs but have hinted that the assessment will be in excess of $40,000. First we would like the Department of Real Estate to determine if it is legal for a Homeowners Association to build roads and utilities, and assess the lot owners an unlimited amount of money. The HOA/Developers apparently changed the CCRs to allow them to develop the roads and charge us whatever they say it cost to build. They have taken about 5 years to develop 190 or so lots in Unit 2. This is absurd. They are paying themselves (or one of their companies) to plan engineer and construction manage. These costs are the being charged to us. Second, The trespassed onto our lots and graded our lots without our permission. They cleared all of our saguaros and ocotillos as well as other cacti and plants from our private property without our permission. They also lowered the lots in some cases and ruined our views. We would like to know if that is legal for them to destroy plants and views on private property without our permission? They have threatened to foreclose on our lots if we do not immediately pay the assessments once they figure out how much they will charge. In some cases that could be $500,000 to $1,000,000 to some of the lot owners. All without permission from us. From what we understand a Homeowners Association is formed to protect property values by enforcing architectural standards, landscape pallets, keep trash cans and broken down vehicles off of driveways etc. It appears here that the Homeowners Association has taken funds from the bank loans and used it to develop lots and pay other companies HOA funds to manage construction and pay themselves. This sounds like they are co-mingling HOA funds to benefit themselves. We have tried in vain to get information on the costs of the improvements and the legality of this scam from Lewis Management Resources Steve 520-742-xxxx and have been told the management company does not have any records for the construction costs. They only assess the lot owners what Jeff Utsch tells them to assess. So basically the management company is only a billing service. This does not seem correct either. We need you help as the State Department of Real Estate. It is our understanding that you are here to protect small lot owners from these kind of people that are only interested in lining their own pockets by taking form the small guy. Please help us. We are also in contact with the Attorney General’s office and have not gotten very far. A few months later we found out that the majority lot owners were being foreclosed by the National Bank of Arizona, the biggest loss in their history, $35-million. At the bank foreclosure, Ms Baranow met Mr & Ms Morris, their Family Trust invested $1-million investing in New Tucson, they bought several of the Assignments of Assessments from the HOA, they said it was a loss. Their son was friends of Mr. Figueroa’s son that’s how they became involved. Mr Figueroa and nearly everyone else involved with the previous majority lot owners is being sued for financial fraud by a man who lost $1-million. At the end of 2008, NT Properties bought 1338 lots out of foreclosure from National Bank of Arizona. Ms Baranow was told by another lot owner that the liens (contracts) in Unit 5 would expire in August 2012. In October 2011 Ms Baranow asked Mr Russo, “who owns the liens on my lots?” In January 2013, Ms Baranow sent the lienholder of the lots in Unit 5 a letter and $10 asking for a quitclaim deed or a quiet title action would be filed. Shortly thereafter, Mr Russo said he was the owner of the Assignment of Assessment and that I should sue him. NT Properties owns about 1300 vacant lots in the Sycamore Vista/New Tucson subdivision (Units 2, 5, 7, 8, 9 and 10), Ms Baranow, the sole owner of 666isMONEY, Lc and Sycamore Vista land for Sale, Lc owns about 50 lots; about 125 other “minority lot owners” own the rest of the vacant lots in the subdivision, about 225 lots have homes. Nearly all the minority-owned vacant lots have HOA assessment liens ranging from $7000 to $55,000 (includes six years of interest), some minority lot owners have paid the assessments and have nothing, no work to show for it, the subject lots in Unit 5 have had all the work done except roads & curbs put in. NT Properties bought their lots free and clear of development liens when the prior majority lot owners/developers went bankrupt on a $35-million loan from National Bank of Arizona. It would be unconscionable for anyone to agree to the contracts and liens . . . I never expected to get liens on all my lots, only on the lots that were being developed, where dirt was being turned. The prior developers put liens on our lots (approximately $6000/each) for the amount they paid to bring water/sewer to the edge of the other Units, for the building plans (which were faulty & never completed, the company that made the plans was sued but NT Properties/the HOA only got a settlement of $250,000), for upgrading Del Torro Road and for a water tower south of the subdivision. Bob Bambauer, a Vice President of KB Homes says we were charged too much for this work. Mr Bambauer worked in the subdivision for KB Homes. KB Homes (or maybe it was DR Horton) sued the prior majority lot owners because they reused to sell lots at the agreed price. The “contract” was that we wouldn’t have to pay until the work was finished . . . the work in Unit 5 (subject property) was not finished, roads & curbs need to be put in. The $6000 liens were not expected . . . it would have been several years or interest added before those lots were ready to be sold to builders. This is an unconscionable contract! We are paying dues ($60/year) on lots that will not be built on — developed with infrastructure for many years to come, Mr Russo said (at one of the annual HOA meetings, I have it in writing), “some of the lots may never be developed,” yet we are paying dues. Most of the dues goes towards HOA management, I suspect there are kickbacks. Mssrs Russo (NT Properties) and Sullivan made bad investment buying assessments on my lots. I’m not really sure Russo actually paid $12,500/lot for the right to foreclose against me. Sullivan & Russo made bad investment buying assessments on my lots. Russo could potentially take everything I worked hard for all my life — suing me for $440,611.12.